Worldwide, the problem of reducing greenhouse gas emissions is solved by fast growth of renewable energy. Contribution of renewable energy in total energy production increases. This comes mainly from stationary renewable sources. However, transport is responsible for almost one third of global greenhouse gases emissions The use of renewable energy in autonomous vehicles is a technical challenge. Therefore, all the more surprising is the progress that was demonstrated in recent years. Of greatest interest are not just demonstration projects, but projects with long-term commercial success. 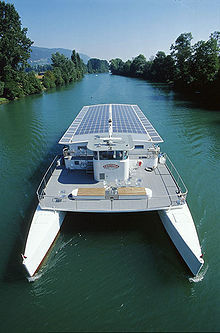 The year 2011 marked ten years of successful commercial navigation of the world biggest solar-powered catamaran MobiCat. This ship was built and started its navigation in 2001. Since then it has been providing pleasure cruises in Seeland (Drei-Seen-Land) region (Switzerland), at the foot of the Jura Mountains with 3 lakes of Morat (Murten), Neuchâtel and Biel/Bienne. This ship measuring 33 m in length and 12 m in width with displacement of 100 tons seats 150 passengers. The electrical energy is generated by a self-contained 180 square metres photovoltaic plant producing 20 kWp. MobiCat has two 4-ton 480 A·h batteries and two 81 kW electric engines. The important purpose of MobiCat project is to demonstrate possibilities of renewable energy in replacing conventional fuels. A ship similar to MobiCat with diesel engines would produce around 500 kg (250 cubic metres) of CO2 per day. Thus, besides saving owner’s expenses for fuel, MobiCat makes its contribution in mitigation of climate change. With its very low electricity consumption, the ship glides through the water almost without a murmur at the speed 15 of km/h. 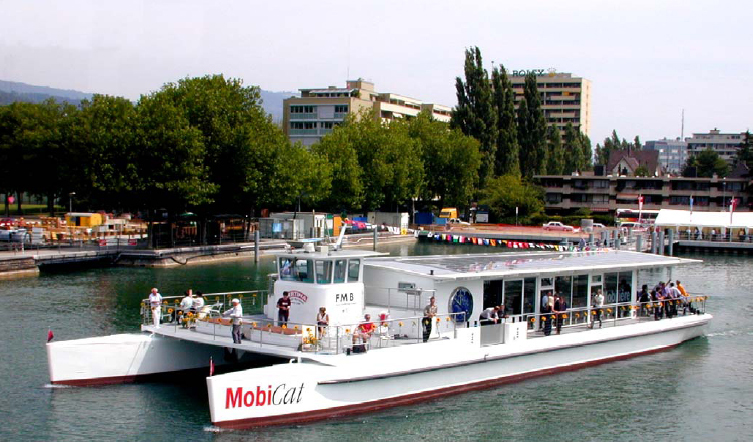 This makes travelling with MobiCat a very special experience and attracts a lot of passengers. The solar catamaran becomes the way to discover lovely surroundings of the lakes with vineyards and smooth moraine hills. Therefore the owner decided to use MobiCat primarily for special excursions. The uses of solar powered ships are becoming ever more ambitious. In the winter of 2006-07, a Swiss team crossed the Atlantic in a solar-powered catamaran Sun-21. It was the first-ever motorised vessel to make this trip without using any fuel. It took thirty days to cover the 5,000 km across the ocean from the Canary Islands to Martinique. In all it sailed 13,000 km from Chipiona in Spain to New York City, where it arrived on 8 May 2007. In 2010, the Tûranor PlanetSolar, a 31 metre long, 15 metre wide catamaran yacht powered by 470 square metres of solar panels, was unveiled. It will become the first ever boat to circumnavigate the world using solar power alone. In order to fulfil this challenge, the boat’s solar panels rated 93 kW connect to two 60 kW electric motors, one in each hull. The shape of the boat means that it is able to reach speeds of up to fourteen knots (26 km/h). This boat with displacement of 85 tons has been designed to be used as a luxury yacht after the record attempt is finished. On 27 September 2010 Tûranor PlanetSolar started on a journey around the world in Monaco. With this expedition, the initiators of the project would like to focus the public awareness on the importance of renewable energies for environmental protection. On 27 November 2010 the solar boat reached Miami. A significant stopover was Cancún, during the United Nations World Climate Conference. End of May 2011, the solar boat docked at Brisbane, Australia. On December 23, 2011, the solar-powered MS Tûranor PlanetSolar had reached Doha, the capital of Qatar, after travelling over 48,000 km. Human ambitions go beyond the water surface. Known are many solar-powered cars. Aspirations of enthusiasts are extended also into the sky. Around-the-world balloonist Bertrand Piccard is working on a solar-powered superlight aircraft, Solar Impulse. In it, he hopes to circumnavigate the Earth, with stopovers, in 2013. The plane has a similar wingspan to the Airbus A340, 63 m, and the weight of 1600 kg. 11,628 photovoltaic cells on the upper wing surface and the horizontal stabilizer generate electricity during the day. These both propel the plane with four 7.5 kW electric motors at cruise speed of 70 km/h and charge the batteries to allow flight at night. Over 24 hours, in the best conditions, the power train delivers an average of 6 kW, enabling the single-seat plane to stay in the air indefinitely. 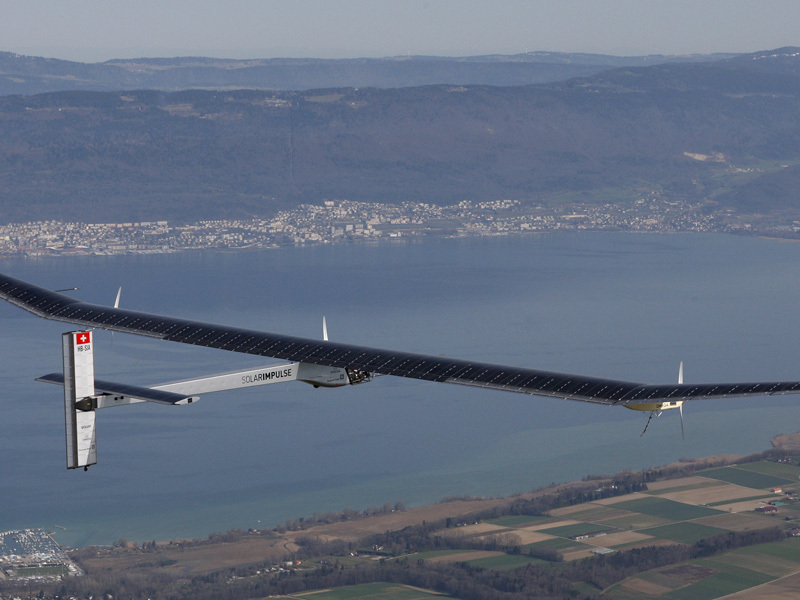 The aircraft first flew on purely solar power, charging its batteries in flight, on 28 May 2010. Russia had no similar achievements so far. It is important that increased use of renewable energy, envisaged by the Climate Doctrine of the Russian Federation, includes the transport sector. Climate Secretariat of the Russian Socio-Ecological Union considers it necessary to strengthen research and development efforts on the use of renewable energy in transport, to include renewable energy for transport sector in target programs and in programs on reduction of greenhouse gas emissions. Initially, it will give only small-scale and specific effect. But developing technologies promise to give us the opportunity to become passengers on board of vehicles that seemed fantastic earlier.